1. Heat the oil in a large saucepan, then add the soffritto, bacon and swede. Stir to coat, then cover the pan and sweat the vegetables gently for 10 minutes, stirring occasionally until softened. Add the garlic and rosemary, cook for a further minute, then tip in the beans and stock and bring to a simmer. 2. Bubble the soup for 5 minutes, then mash the beans and veg a little using a potato masher – this will add a little body to the broth. Stir in the cabbage and return to the boil for 2-3 minutes until just tender. Stir in half of the cheese, season to taste, then serve in bowls, topped with the remaining grated cheese. 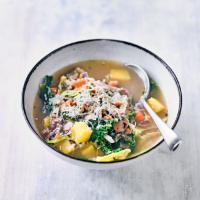 Cook’s tip Save time chopping and preparing vegetables for homemade soup by using a 400g pack Cooks’ Ingredients Minestrone And Bean Soup Mix.